April 29th, 2014 our friends Fred and his Mom became United States citizens in a special ceremony in Oklahoma. They were very excited, as it had been a lot of hard work to pass the citizenship test. We couldn’t be there for the big day so I had promised them we would celebrate the next time they came to southern California. On June 22, 2014, we had that celebration! Fred’s Grandma was here from Vietnam and it would be our first time meeting her. It was nice to have another Grandmother in the house! I really wanted to make this special for all of them and since they were coming less than 2 weeks before the 4th of July finding decorations was easy! I had the driveway lined with small flags and red white and blue decorations everywhere. Jenna’s Mom had even found red, white and blue glitter and stars and I had them scattered all over the counter and the tables. Amara had an absolute blast gathering it up and throwing it in Fred’s Mom’s hair! Of course, Fred had to help, too. Then somewhere along the way, they found a ball of yarn and decided they needed to run around the house with yarn, trying to confine us to our chairs. Crazy kids! I had decided we needed to have a very American meal to celebrate them being Americans! We could have had barbequed hamburgers but that just seemed too ordinary and I knew they had them at home. I decided on meatloaf, fried chicken, homemade potato salad and corn on the cob. I made red, white and blue fudge for dessert. I thought about making apple pie but I knew that Fred’s Dad would be disappointed if he didn’t get brownies so I made those instead! When dinner was over the kids were bored so playing in the water seemed like a good solution. They had a blast and Fred’s Mom had almost as much fun chasing them as they had chasing her. 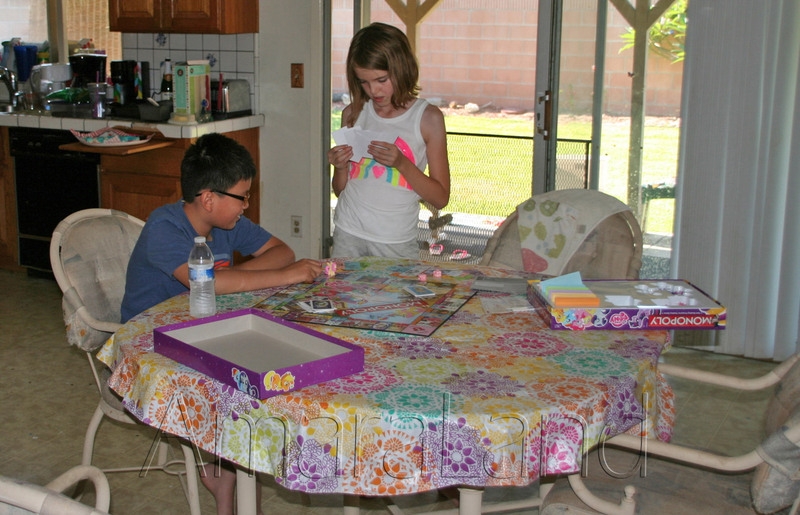 Since the sun was starting to set, it got cool quickly and they were back in the house for a game of Ponopoly! It was a great day and we really want to congratulate our friends! This memory was posted in Special Occasions and tagged Amara, citizens, Fred on July 16, 2014 by Grandma Kc. A perfectly appropriate celebration for all. It really was a great day and I am so glad we could do it before Amara had her teeth pulled! Congratulations to the new citizens! Welcome! Such a great celebration of citizenship and friendship. Cheers to all! All I can say Debra is that at some point Fred did something to annoy Amara and she threw her hands in the air and said “And this is why I hate playing with boys!” And then they went back to playing! What a great celebration — congratulations to your friends! It’s wonderful that Amara could be a part of the celebration, and perhaps learn something of what it means to be an American. Plus the meal sounds awesome — very American and Southern…. even though you are in CA!!! Monopoly with ponies?? Must tell Noli!! Oh Sarah you must tell Noli! It isn’t really called Ponopoly but that is what we call it. It is just the My Little Pony version of Monopoly and it is really nice, very high quality and well done! 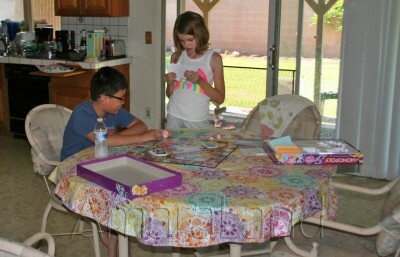 The game board is just similar enough but very MLP! And of course the game pieces are all ponies! She will love it! It’s always a pleasure to welcome new Americans. Congratulations to all of them. Your entire menu sounds delicious … I could go for the fried chicken right now. I can imagine they were tickled pink, er, I mean red, white and blue. Fun times. They really were pleased! I think that since it was 2 months after it actually happened it made it even better — got them all excited all over again! We really are thrilled for them! What a warm American welcome you gave those lovely people! If they ever had any doubts that this was the country for them it was swept away with your fried chicken and brownies and more! Amara has a friend from whom she will learn far more about the Vietnamese culture than any textbook can relate! What a great celebration of becoming American citizens. I don’t think we can really understand what that must mean to them. So happy for them! Fred’s Mom really seemed so touched that we threw a party in her honor and I think she was happy that her Mom could be here to share it. I’m glad they keep a home here so that we get to see them at least once a year. It is so fun to see how much Amara and Fred grow!